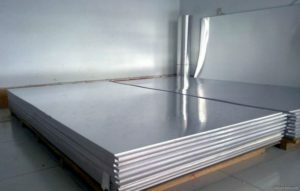 How to choose a guaranteed aluminum sheet manufacturer ? Aluminum sheet has a vast consumer market because of its excellent performance, many industries start to use aluminum sheet as a substitute for traditional metal materials. Especially in recent years, the production and sales of aluminum sheet have grown rapidly, various aluminum manufacturers springing up, but many of them are small companies and unqualified. So how we choose the guaranteed one in so many aluminum sheet manufacturers? In China, business license, organization code certificate and tax registration certificate are the three basic certificate of a enterprise. Customers can check whether the company certificate is complete, whether company’s name is unanimous, this is the most intuitive way to check whether an aluminum sheet manufacturer is standard. The strength of an aluminum sheet manufacturer can see intuitively from its registered capital, the strength of a company with a 30 million registered capital absolute much higher than the strength of a company with a 3 million registered capital. The length of operating time is no direct relationship with the strength of an aluminum sheet manufacturers, but there is no doubt that a company with a operating time more than 10 years is more professional than a newly established company.